Blue with a gold-hooded falcon standing on a red perch. 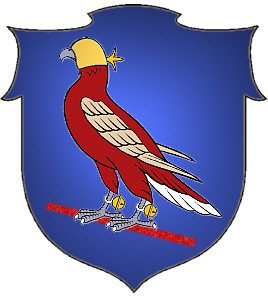 A Falcon or Hawk in Heraldry is usually depicted with bells on its legs. 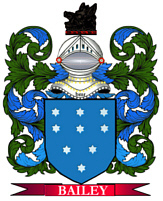 If represented with hood then it is said to be hooded, jessed, and leashed, and the colours must be named. Hawk or Falcon. A very common bearing in Coat Armour. A Falcon, blazoned ppr. is represented with a bell tied to each leg. Spelling variations include: Musy, Musie, Musies, Mussy, Mussie, Mussies, Mussey, Mousy, Mousie, Musset, Musy, Musse, de la Musse, LaMusse, DeMusse, Mussi, Musi, Mousies, Moussy, Moussie, Moussies, Mucy, Mucey, Mucie, Mucies, Moucie, Moucies, Moucey, de Musy and many more. First found in Brittany, where they have been seated since ancient times. Some of the first settlers of this name or some of its variants were: Ludwig Mussi, who settled in Philadelphia in 1754; and Abraham Mussey, who settled in New England in 1633. The distinguished surname muzzy can be traced back to the ancient and beautiful region of Venice. Although people were originally known only by a single name, it became necessary for people to adopt a second name to identify themselves as populations grew and travel became more frequent. The process of adopting fixed hereditary surnames was not complete until the modern era, but the use of hereditary family names in Italy began in the 10th and 11th centuries. Italian hereditary surnames were developed according to fairly general principles and they were characterized by a profusion of derivatives coined from given names. The most common type of family name found in the region of Venice is the patronymic surname, which is derived from the father's given name. During the Middle Ages, Italians adopted the patronymic system of name-making because it perfectly complemented the prevailing feudal system. In Italy the popularity of patronymic type of surname is also due to the fact that during the Christian era, people often named their children after saints and biblical figures. The surname muzzy came from the name Muzzo, which is derived from the Latin name Mucius. The name may also be derived from the name Giacomuzzo, which is a variation of Giacomo, or James. 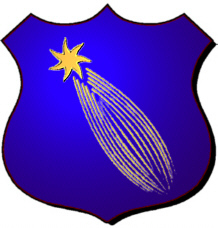 Coat of Arms: A blue shield with a gold shooting star. FALCON: Is derived from the Latin "falx", meaning sickle, a reference to the Falcon's wing shape in flight. Egyptians associated the Falcon with the 'Eye of Horus'. The god Horus was believed to appear in the form of Pharaoh's Falcon or as a Falcon-headed god. The mythology states he could see everything at once because one eye was the sun and the other was the moon. It is written that Falcons were permitted to ride on Pharaoh's nape as his protector and divine spirit. Falcons were used in a royal sport known as falconry. Is the art of training Falcons (or hawks) to pursue and attack wild fowl or game; falconry started in ancient China and Persia and soon became prevalent with the royals of ancient Egypt; the Falcon was associated with the Egyptian sun god 'RA' and later the Christians adopted it as an emblem of the saviour. 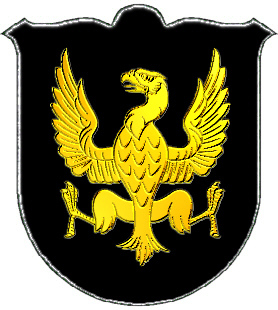 A venerable symbol of majesty and power, heraldic writers add that the Falcon denotes someone eager, or hot in the pursuit of an object much desired; if seated on its 'rest' or perch it may signify a bearer who is ready and serviceable for high affairs. You have been in contact with my son Eric Muzzy of Warminster, PA. I am sorry to say that we cannot help you with your project on MUZZY genealogy, except to clarify some situations. My grandfather and a brother arrived in the United States in the late 1800's from Lithuania. The name at the time was Mazurkiewicz. Over the years all of our family have adopted and changed the name to Muzzy. To confuse matters even more, for about eight years our immediate family lived in Woburn, MA. You may know that the Muzzy's go all the way back to the Battle of Lexington, where one was killed in 1775, and later had a high school in Lexington named in his honor. He was from Woburn. There are many Mazurkiewcz 'Muzzy's' in New York City area, i.e. Long Island and New Jersey. Some also in Daytona Beach, FL, and San Diego, CA, as well as Framingham, MA, Warminster, PA, and yours truly. If your correspondence brings news from others that have changed names and originated in Lithuania, our family is interested to contact them. The MUZZEY/MUSSEY family immigrated from a valley in France @1633-34 on the second voyage of the "Mary & John". America in 1633 on the ship 'Mary and John' from England. Abraham died shortly after arriving in America. The name was French, spelled MUSY, after the town of Musy. In the 1300's when people were first adopting last names, some of the men in our family went to war with Joan of Arc. They fought so bravely she, or whoever did such things, gave them some land in the Loire Valley (I think that's the right valley), and the right to adopt the name of their village for their sir name. They, or at least some of them, left France around the time of the Inquisitions in the 1400's, and went to England where the name became MUSSEY. They came to this country in 1633 with the Mussey spelling. Due to different pronunciations, and census takers who spelled phonically, it soon became MUSSEY, MUZZEY, MUZZY, (Muzzi is Swiss-Italian and no relation to us). All these spellings are in use today. There is one family in the 1700's that had 2 daughters and 3 sons, and each of the son's lines comes down with one of the three spellings. We are not connected to the name MUSSETT, as we once thought we were. As to the Boston Tea Party, no doubt, but don't know who. Lexington, MA was owned by the Muzzey family, and they built the original Buckman Tavern, and the first to fall in that battle was Isaac Muzzey. There is a monument to him on the green. [Joanne is a Muzzy researcher and Genealogist - once lived in Alaska, now lives in Colorado]. ****************** 8 Thaddeus I Muzzy b: August 14, 1773 Spencer, Worcester, MA d: September 14, 1854 possibly Wisconsin?? ******************************** 13 Betty Jean Matteson b: Corry Memorial Hosp Corry, Erie Co Pa.